John Cuellar, Daniel Garcia and A.C. Cuellar Jr. were arrested by the FBI on the morning of Friday, April 5, 2019, believed to be in connection with a bribery investigation in Weslaco. High-profile individuals arrested by federal authorities over the past few weeks now face additional charges related to an alleged bribery scheme involving the Weslaco water treatment facilities. In a 34-page superseding indictment filed Tuesday, government prosecutors lodged new charges against four of the six defendants accused in a bribery conspiracy. Former Precinct 1 Hidalgo County Commissioner A.C. Cuellar Jr., former District 2 Weslaco City Commissioner John Cuellar, Rio Grande City school board trustee Daniel Garcia, and Weslaco businessman were all named in the superseding indictment. They, along with former Rio Grande City municipal judge Leonel Lopez Jr. and current District 4 Weslaco City Commissioner Gerardo “Jerry” Tafolla, are accused of participating in a bribery scheme between 2008 and 2016. As part of the scheme, Garcia, Quintanilla, Lopez and A.C. Cuellar allegedly funneled approximately $4 million in bribes to John Cuellar and Tafolla. In exchange, the two then-city commissioners are accused of voting to award contracts to three engineering companies for a $38 million project to overhaul the city’s water treatment facilities. In the superseding indictment, Quintanilla, Garcia, A.C. Cuellar and John Cuellar each face a charge of conspiracy to commit honest wire services fraud, six counts of conspiracy to commit honest services wire fraud, and one count of conspiracy to launder monetary instruments. Quintanilla, A.C. Cuellar and John Cuellar each face an additional count of federal program bribery. Quintanilla also faces eight counts of money laundering and one count of violating the travel act. A.C. and John Cuellar, who are cousins, collectively face 27 counts of money laundering and 27 counts of violating the travel act. 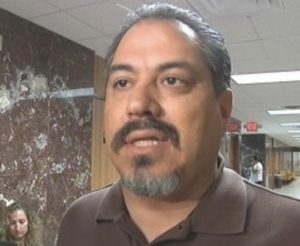 Upon A.C. Cuellar’s arrest last week, his attorney, Carlos A. Garcia, spoke highly of his client’s reputation. If convicted on charges of wire fraud and money laundering, they face up to 20 years in federal prison for each count. The four named in the superseding indictment have been released on bond and are scheduled to be arraigned on April 18. Lopez and Tafolla both pleaded guilty to federal program bribery and were also released on bond. They are scheduled to be sentenced in July. Both face a maximum sentence of 10 years in prison.